The evolution of an athlete over the course of a long career can be fascinating to watch. What is challenging for fans and journalists is to see the whole story beyond the track and the field: the evolution of a human being. 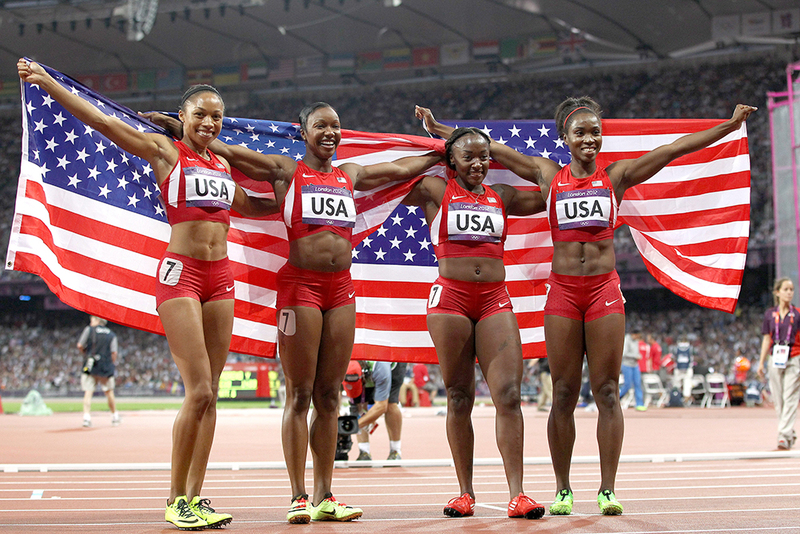 Tianna Bartoletta is a perfect case in point. An unexpected world champion at age 19 as Tennessee soph Tianna Madison (who said, “This was no surprise at all. I knew that this was going to happen; I just didn’t know when”), an Olympic champion at age 30, and in between, unimaginable highs and lows. It’s rare to find a professional athlete so open about their triumphs and travails. 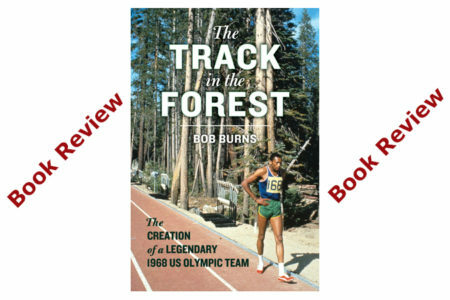 T&FN: Your book, Why You’re Not A Track Star, it’s unlike anything else out there. What inspired it? Bartoletta: What inspired it was the 7 years that I spent not being a track star. 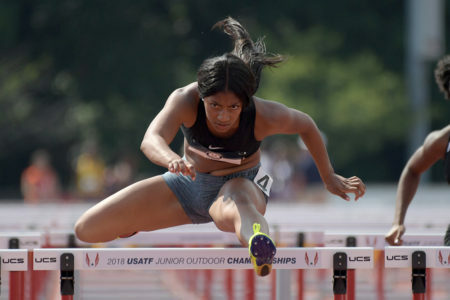 To win my first medal at 19 years old and to back it up the following year with an indoor medal and then to do absolutely nothing until 2012 [when she took 4th in the Olympic 100 and led off the WR-setting U.S. 4×1], that was a hard time for me. I spent a lot of time in those 7 years being embarrassed, floundering, being frustrated, succumbing to depression and so once I got on the other side of that, starting in 2012, I started to reflect more on that time. Why is it that that period was so drastically different from this period? It feels like I’ve had three different careers in one body. I figured if I could reflect on it enough to get clarity enough to articulate it, write it down, then maybe I could spare other people from having to go through that. T&FN: You’re really a master of timing and impact and how to put those sentences together. When did you become aware that you could do this? Bartoletta: I’ve been writing for a long time. I think my first creative writing class was in the fifth grade and I got a lot of high marks and entered into contests for my writing. I became an even better writer after I became a voracious reader. The more I read, the better I became as a writer. And my writing style, the timing comes from me being a fledging poet for several years. I used to write a lot of poetry and the thing that I love about poetry the most was the timing of the line and how the same line spoken with a different word emphasized can mean something totally different. That helps me understand the importance of spacing because when you’re reading, it’s up to the reader to interpret. Right? And so I use spacing and those things visually to guide the reader toward the feeling that I’m feeling while still leaving it open for their own interpretation. T&FN: And now you’re doing speaking tours. Bartoletta: It’s one of those situations where I just felt like it was time, but I also am a perfectionist and I don’t feel like I’m ready [laughs]; I have to just jump into the fire. I know how to have these discussions and how to break them down practically for younger athletes to understand and I know that I absolutely love talking this over with athletes, so I figured it was just time. I just feel really comfortable and most alive when I’m in front of people talking about this subject and it’s a sport that I love and I have passion for it. So it’s like, I want to be in the trenches with you, trying to figure out how to get from point A to point B. I love that. I think it caught everybody by surprise because I went from not having been home 7 years to suddenly I’m going to be home and doing community events and mixers and clinics. I’m looking forward to it. T&FN: With all that you’ve got going on, are you finding any time to train these days? Bartoletta: Yeah, I do train. Just actually started so I’m in what I call “pre-pre” season. Because of the schedule for this upcoming track season, I don’t really have to start training until a lot later than I usually do, so that’s why I’m taking advantage of this time to kind of get out there because once I really, really start training, I’ll be less available and then after this year it’s an Olympic year and I might be even less available. So that’s why the time is now. I hope people take advantage of my openness right now because I might not be able to spend myself this way later. T&FN: In your latest blog post, it mentioned the carnage of your divorce proceedings and the toll it took on you. In this sport, we’re often very guilty of pretending that our heroes are athletes 100% of the time, but real life is out there and you’ve gone through more than your share. How difficult has that made it for you to focus on athletics? Bartoletta: It’s extremely difficult. I mean, I think the world saw me struggle with trying to handle that and being an athlete in London at the World Championships and I nearly failed to medal because that struggle was so great. I don’t think that it’s really easy to understand the intersection of life and track, especially on the circuit. So yeah, for example (last year), I was dropped from London Diamond League because of a mistake between my manager and the director and on the surface it’s like, “Yeah, that’s totally part of the game, that happened.” But for me it was like, “Wow! I kind of needed that opportunity because I need to be able to pay my divorce attorney.” So now I don’t have that, now I’m not in the meet and now the way I make my income is being determined by managers and meet directors and that 100% decides whether or not I’m able to maintain my standard of living at home, which 100% affects my mentality that I bring to the track. So there’s no way that we’re acting in a vacuum. No way. T&FN: You mentioned in your blog that you took a huge cut in your latest contract with Nike. How do you process something like that? Bartoletta: Technically it wasn’t a cut, it was that my existing contract expired and I was negotiating a new contract and the issue became that they could cut it because other shoe companies wouldn’t even bother to return phone calls or e-mails for whatever reason. And so it’s basically one of the situations where you take this or you take nothing. And that’s business, you know, just the way it is. Did I go back and forth between taking it personally and realizing that it’s just business? Absolutely. I was livid; I was disheartened and very upset and disappointed. But it’s business. And so at the same time, I understand. T&FN: Last year was an off-year for a lot of athletes, but you mentioned that your first jump indoors in Berlin last winter foreshadowed how your season would go. Bartoletta: That was horrible [laughs]. I was on the runway and completed the jump. And after that jump, I knew a few things. One, none of my training to that point was sufficient enough to prepare me for what I was asking my body to do. 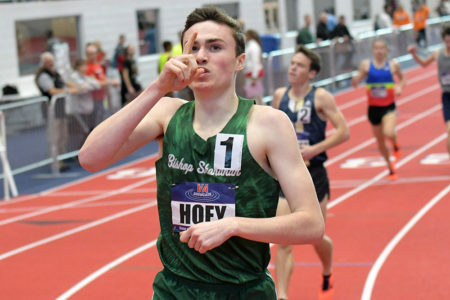 And two, I understood that I wouldn’t have enough time given how short indoor season was to fix that issue, and that my indoor season was essentially a waste. That was an upsetting realization because I had a full schedule of confirmations with meet directors, none of which I wanted to just back out of because I wasn’t comfortable with competing. 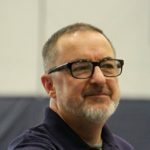 I think it put me in a really difficult place because do you back out of commitments because you are not ready to compete at the level you’d like to compete? Or do you go anyway? And even though it might be embarrassing, you fulfill your obligations and you mingle with the fans that are expecting to see you there. That was a struggle that I had all indoor season. I knew that I could try to make a run for correcting that for outdoor season. But I knew that my season was over, which for me was very difficult because of my off-the-track stuff that was going on. I really felt like having a good indoor season would just help be a lifeline for me because I mean, I think I wrote somewhere that the divorce process is like death by a thousand cuts. It hurts. It’s a slow, long, painful death of a marriage, of everything, of stability, of security. And just the way an athlete feels amazing after winning or performing well, I really needed that at that time. Or I thought that I needed that. And so it was really disappointing to realize in that moment just after that first jump, that’s not what I was going to get that year. T&FN: Were there moments where you thought about quitting? Bartoletta: Oh, I think about quitting often [laughs]. I’ll just be honest. I’m not one of those athletes that never ever think about quitting. It’s just that I never actually do, which is the only thing that matters (laughs). So yeah, I think about quitting all the time. I found myself in really strange situations like in the BBC studio doing radio because I couldn’t get into a meet. I would look around and be like, “Oh, this is so interesting,” because on the one hand I worked really hard to be this athlete, but there is so much out there. I’m suffering voluntarily trying to stay in the sport that I love when I can be doing other things that I might love. I feel that way. Honestly. Every time I see a tweet about some new unnecessary IAAF rule, honestly, it’s just like, it’s just ridiculous. For me, it’s just, why even continue to try to be successful in the sport when I can be successful in a ton of other things? So yeah, I think about it often. T&FN: You’ve written about age as it applies to sports. And you shared an image of Marion Jones wiping the sand off your face at the 2004 Trials. Can you tell us more about that? Bartoletta: As a freshman at University of Tennessee that year, my coach had high hopes for me, but I didn’t live up to the high hopes, but I also wasn’t horrible. And so we went to NCAAs. I think I made the final, but nothing spectacular. The week after that we went to USA Juniors. And I jumped 21-8 (6.60) and that distance would have made the podium at NCAAs the week before. So my coaches were in a position to be like, “Omigod, we knew it was in you, but how dare you wait a week when we needed those points last week” kind of situation. That was the year that the Juniors went to Grossetto, Italy. But my coach told me she made the brilliant decision not to actually let me go and instead she made me go to the Olympic Trials. I think she felt like it wouldn’t have been a challenge enough for me to go to Juniors. She wanted me to feel what it was like to be at an Olympic Trials. 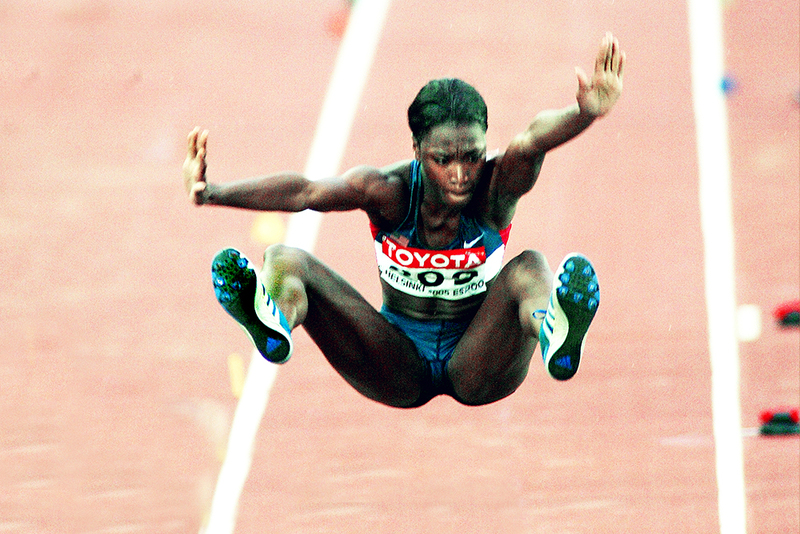 At the beginning I was a little bit overwhelmed by the atmosphere, but by the time we got around to the long jump, the competitor in me was out. But the other women there were very much like, “Oh my goodness, this is so amazing, you’re the youngest one out here, look at you! You’re so cute! You’re so young!” And that was the first time that I felt that like, “I don’t care how old I am, I’m trying to take you out [laughs].” It was the first time that I actually had to experience that. I saw Marion and it registered that it was Marion Jones. And then I also instantly registered that I didn’t care right now that it was Marion Jones. And then I thought maybe if I saw her after the meet somewhere, I would get her autograph or something. But right then I could care less. And so when she came over to wipe the sand off my face, I just had this knee jerk reaction like, “Really? You don’t see me as a competitor? OK, well I am your competitor. I don’t need you to wipe sand off my face. Thanks. But no thanks.” And I was so angry about it. I never asked for the autograph [laughs]. T&FN: At the other end of the age spectrum, you’ve mentioned that you train as an elite athlete, instead of being on the AARP plan. How has your training evolved over your career? Bartoletta: For me, it’s so smart now: I get to be a scientist, I get to be a researcher; I get to document everything and it’s one of those situations where as a younger, as even a collegiate athlete, you kind of just do what you’re told. Maybe you keep a training log but that’s rare. You kind of just trust that you’re on track when you show up every day, you do what you’re told, and that’s it. And then as, as an early pro, you might write down your workout, you might write down the times you ran, just kind of keep track of your progress. For me now my hand is in everything. I know what system I’m working on. I know if I can’t do a certain thing because of how I’m feeling, I know a ton of alternate exercises or programs that can accomplish the same thing. I know when my peak week is, I know when I’m going to feel better. And so for me that makes it way more fun and challenging but satisfying. T&FN: At this point in your career with, with everything that you’ve learned, what is it that you need a coach to do for you? Bartoletta: I need a coach to be my eyes because at some point I can’t be doing all the thinking; at some point I have to just execute. In the heat of an event, in the long jump, I can’t tell where my foot is at takeoff. I can’t see where I am at this checkpoint. I don’t always feel that my chin is too high going into the board. With the sprints—especially the sprints—when I get to a competition, I’m scared. Like I don’t know what it is about the 100, but I’m scared to death before every race. I’m not so scared that I’m not going to execute or give maximum effort, but my brain is like, it’s all over the place a little bit because I do feel the fear of needing to go from 0 to 100 quite literally as fast as I can. The 100 is not an easy race for me. I think that a lot of people think it’s easy because it’s a straight line and it’s short, but there’s a lot that’s happening and the coach for me—if they have been with me every day, if I know they’ve helped me prepare the best way possible—honestly is a calming influence on me before that event. So it’s not that I need them to coach me up at that moment. It’s just like I need my moral support. I need my team because we’re all in it together. And often—you probably notice this with young athletes—you get better performances when they feel like they’re doing it for their team sometimes than when they’re out there by themselves. So that’s the feeling that I need from my coach and whoever are my teammates at the time. T&FN: What does your coaching situation look like these days? Bartoletta: Charles Ryan serves as my extra set of eyes and helps me watch video of myself. Carlo Buzzichelli, he looks over my strength and training program. Makes sure that I don’t go too overboard because I tend to err on the side of too much work. So, he reviews that. And that’s where we are right now. My recovery team, my therapist and chiropractor, they all changed. But those two people are the most stable right now. When I’m in the U.S., I’m in Alabama and I spend a lot of time still in the Netherlands and in Italy. T&FN: What are your thoughts on the next few years? 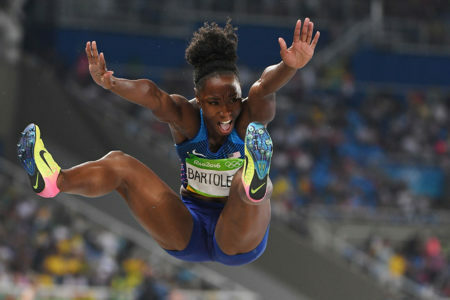 Bartoletta: One year at a time as usual, but this year the plan is to make the World Championship team, especially in the long jump, bonus for the sprints. But I will most definitely still train as a sprinter. I still want to sprint at a high level and whatever happens happens with that event, but I definitely have so much to improve on in the long jump that I’m looking forward to being able to do that while making the World Championships team. The new IAAF structure… it’s only their meets in which you can experience upward mobility. By that I mean World Challenge, Diamond League meets. Now those factor heavily into your world rankings. Your world ranking factors heavily into your qualification for World Championships and here’s the problem. World Challenge meets and Diamond League meets are run by one or two people, one or two meet directors who are humans who might also be agents who also have their own interests in making sure certain people are at a certain meet, so now it’s no longer a matter of you have this performance and so you have earned this spot. It’s a matter of, “My client is a long jumper and so I’m going to exclude these long jumpers from this,” and by doing so, those jumpers don’t get the points that they might need for their world rankings which can affect them later. Not to mention financially there’s less money in the sport. There’s fewer meet opportunities and now who gets into what meet is largely in the hands of a small group of people. That’s the problem. And that’s a little bit bigger problem than the new 30-second rule in the field events? Yeah, a much bigger problem than the 30-second rule. Much, much bigger. The 30-second rule, that’s just annoying. The other rules, you can very much rig and manipulate who succeeds by the end of the season by just making sure a handful of meet directors let the same person into all of their meets and then, bam, it’s done. T&FN: In terms of medals, you have been extremely successful. Do you still feel there’s unfinished business out there for you? Bartoletta: I love this question because if you had asked me this maybe like two months ago I would’ve said yes, but since I’ve actually been through 200 hours of yoga training, the answer is now no [laughs]. The reason I was out there last season when I should’ve been resting was because there was this feeling that my list of accomplishments wasn’t complete or that I wasn’t complete or that I wouldn’t be taken seriously or considered great until, you know, I had one more medal or one more Olympic Games, one more, one more, one more. But now I look back on all my accomplishments and specifically my mindset as I achieved them. And I’m like, I don’t feel at all like there is anything else that I need to do different. I don’t feel like I need to make another World Championship team or make another Olympic team for people to see value in the career that I’ve had. In fact, I no longer care if people see value in my career at all because I see value in it and I know and appreciate myself for the journey that I’ve had. It used to burn me alive that Nike doesn’t ask me to do commercials or photo shoots, it used to like make me feel like, “Ooh, I guess I haven’t done enough. I haven’t been successful enough because they don’t ask me, you know.” But I no longer feel that way about anything external. Validation comes from my career and it’s really just about how I feel about it. And I feel pretty freaking awesome about it. T&FN: Well said. Is there any one moment you can point to among many moments as the highlight of your career? Bartoletta: I think 2016, the Olympic Games is the highlight. Not just winning the long jump because that was a dream come true, but I’ll tell you one of the first thoughts that I had while still in the field at the Olympic Games after I learned I won was that finally I could publish my e-book. That was the first thought because I had been working on it for 3 years and I felt like people wouldn’t take me seriously because I hadn’t done that yet. So when I won, I was like, “Oh my gosh, I can finally put this out there and people, maybe will listen, because I’m the Olympic champion now.” First thought, which I find surprising in hindsight. I’m very proud of the relay as well because there was a lot of adversity involved in us making that final and just I’m just really proud of stepping into that leadership role even though it wasn’t bestowed on me and really setting the tone for that team from round 1 on a rolled ankle all the way through the final. I’m just very proud of that. A huge display of character. Even if nobody really knows the back story I know, and I’m very proud of that. T&FN: We put an immense symbolic value on winning medals. The physical medals, what do you do with them? Do you ever take them out, look at them at once in a while? Or are they buried in a sock drawer? Bartoletta: They’re not in the sock drawer, but they’re not line of sight where I look at them every day because we’re also trained as professional athletes—at least with shoe contracts—that your last medal does not matter at all. We’re groomed to be thinking about the next thing, the next thing, next thing. I mean when I walked through the mixed zone at the Olympic Games, they’re asking me about 2020 and I hadn’t even received my medal for 2016 yet. So it’s like one of those situations where yes, there’s a lot of value in the medal and at the same time no value once you have it, so there’s no point in really looking at it and drooling over it after you’ve earned it because everybody’s moved on already. 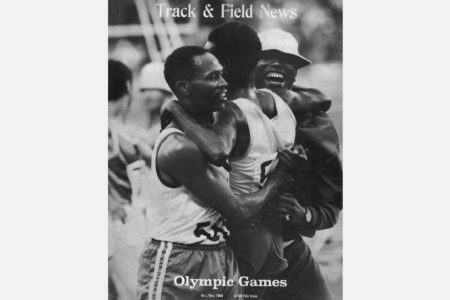 T&FN: You’ve mentioned in your writing the legacy of Jesse Owens. Being from the Cleveland area, does it have any special meaning to you personally? Bartoletta: For sure. 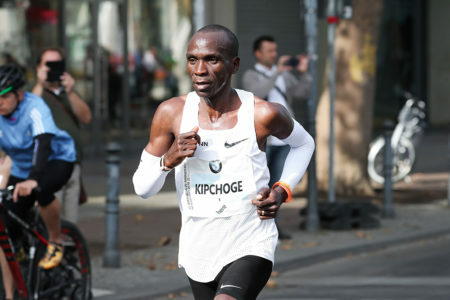 It’s the reason why I keep going back to Berlin as well, because of his display of character amid all that adversity. It’s just amazing to me that more people don’t understand, especially young athletes. I told the USC team a few weeks ago, “How many of you have experienced something that made you feel like you couldn’t run? And so you didn’t run well at a competition that day because you got into a fight with your parents and it just threw you off” and a lot of people raised their hands. And I just think there are people in the world like Jesse Owens who will experience way deeper, way more traumatizing things and still can execute and still can rise up. And so that’s why I told them, I have a phrase that—it’s almost a mantra on competition days, especially when I’m going through hell—physics doesn’t care. Physics does not give a bleep about anything other than you executing enough so that its laws can be applicable to your performance. So I said to them, “There is no variable in the formula “f = mass X acceleration” that accounts for the fight you had with your boyfriend. So it really just eliminates the excuses for the lack of ability to execute and Jesse Owens represents that for me in a lot of ways. I really admire Caster [Semenya] for how she handled everything that’s thrown her way and still gets out there and competes knowing that every time she competes it sparks a huge firestorm of controversy. I love that she does it anyway. This is the lesson that we all can take from her. She shows me something that they talk about in yoga all the time: you commit to your efforts and the rest is out of your control. I feel like she does that really, really well because she doesn’t let it stop her from starting. And I think that’s really important. She sets a really good example for all types of people. T&FN: When you were a young athlete at Elyria High, did you even come close to dreaming this is how the sport would pan out for you? So track won out by default. 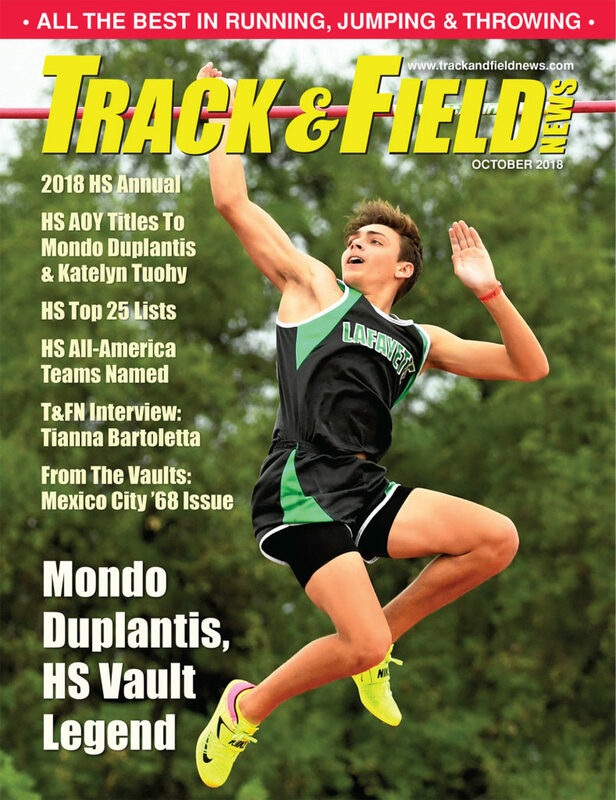 I decided I would really do the best that I could to get to college and so that’s when I started running indoor track and started running summer track to get more exposure to coaches and higher caliber of competition. It was all in the hopes that I would get a scholarship to a university that would take me out of Ohio and that was the end of that. I didn’t have any real hopes beyond collegiate track, really. T&FN: What kind of car did you get? Bartoletta: I got this little 3-door Saturn. I loved it because I would tell everyone at school that my car had a suicide door. I thought that was the coolest thing on the road [laughs]. T&FN: What would you have ended up being if you had never been an athlete? Bartoletta: I think I’d have been a doctor, because I still very much love research. If I weren’t an athlete I would have stuck with my molecular/microbiology majors, saw that through, probably would have gotten my MD/PhD and would be doing research now trying to figure out how to manipulate viruses for cancer treatments. T&FN: If you had gotten a million-dollar contract when you were a 19-year-old world champion, would you still be out there competing? Bartoletta: No. Not only would I not be competing, but I probably wouldn’t have discovered any of these other aspects of my personality either because these little gems of my personality have been polished by the fire of adversity over the years and by not getting breaks and having to claw and scrap for everything and just knowing what it’s like to have to figure it out for myself. I would be altogether a different person and I wouldn’t still be in the sport. I know that for fact. T&FN: Final question: do you still find enjoyment in the simple act of running fast or of leaping into the air? Bartoletta: Omigod, yes. l love, love to train. So even if I was not competing, I probably would still go to the track every day. I would still set up my timing system. I would still bring out my tape measure. I love it. I like figuring out how to be faster. I like jumping far. I like that feeling of just putting it out there and seeing what it gets you. That will never go away. Hopefully I’ll learn how to flip that and parlay that into other things in other industries. But I love, love, love that. That love is true and therefore will never die.